Here is an extract of the Powershell module of my SharePoint 2010 for developers course. In this lab, you will work out a number of exercises that have to do with Powershell. In Lab1 you will discover the main Powershell concepts; in Lab 2, you will apply these concepts. 1. 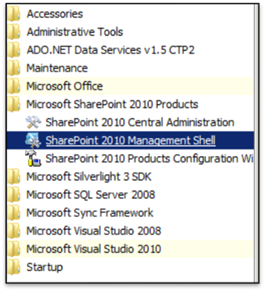 Start the Sharepoint 2010 Management Shell. Sharepoint commands are organized as verb-noun like Enable-SPFeature. You can type Get-Command –Noun SPFeature*or Get-Command –verb Enable. This entry was posted in Computers and Internet and tagged Powershell, SharePoint by mikef2691. Bookmark the permalink.